How lucky is the world to be given not one Pixar film in 2015, but two? Granted they skipped a year in 2014 but still. The earlier release this year of Inside Out was met with stellar reviews (and still ranks in my top 5) and is considered among the studios best. 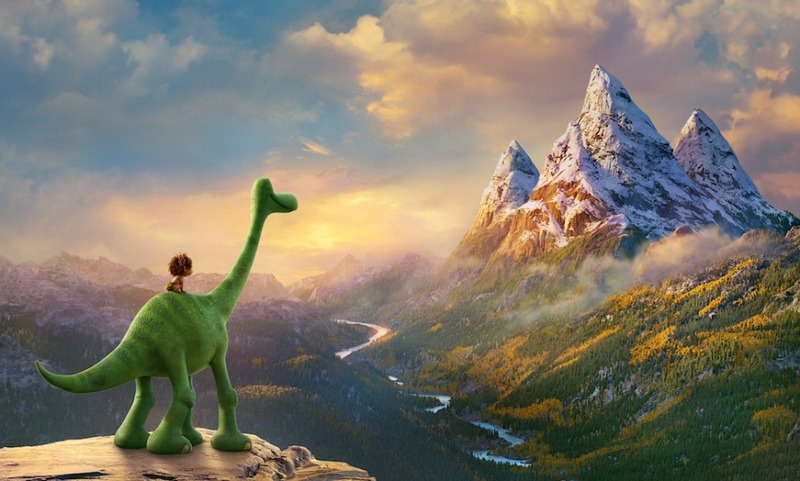 While it’s not fair to compare that and Pixar’s new film The Good Dinosaur, its bound to happen. 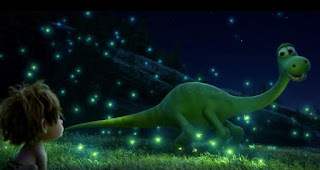 And while The Good Dinosaur isn’t the masterpiece that it’s predecessor was/is, the fun tale set in prehistoric times is still another great entry into the Pixar filmography. The setting is millions of years ago, where the asteroid that wiped out the dinosaurs never hit. Arlo (Raymond Ochoa), an Apatosaurus, and his family are simple farmers (yes, farming dinosaurs), just trying to get enough food together to make it through winter. Unfortunately a rainstorm washes poor Arlo downriver, leaving him bruised, battered and miles away from home. 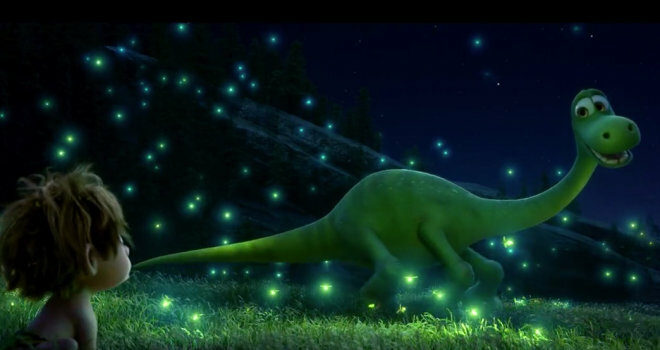 Good luck shines on the frightened dinosaur when he meets Spot (Jack Bright), a boy who offers his help and friendship. Together, the unlikely duo embarks on an epic adventure to reunite Arlo with his beloved family. Right away I have to say that no other animated movie has ever looked as stunning as this film does. From the vast landscapes to the storms to the rushing river, everything looks so real that you’ll wonder how they integrated these animated characters so well into such memorable scenery. The film excels beyond just looking pretty though. While the story isn’t super complicated, just a typical adventure story, it’s enough to create interesting characters along the way and loveable main characters as well. I always have a hard time knowing when voice work in animated films stand out but one thing is certain: casting Sam Elliot as a Tyrannosaurus Rex cowboy may be one of the best decisions Pixar has ever made. First time director Peter Sohn, who also voices the weird but hilarious character Forest Woodbush in the film, must also be commended. While he is stepping into the director’s chair for his debut, Sohn has been with Pixar for many years, working on various projects throughout (including being the inspiration for a certain character from the wonderful 2009 film Up). Sohn proves here that Pixar’s in-house hiring method is a solid strategy, showing his ability off in this delightful film. So what did you think of The Good Dinosaur? Have you seen it, and what's your favorite Pixar film? Comment below and let me know and as always return to I Am Sam for weekly reviews.